Kirshner Publishing is an independent publisher of books and information for those involved in construction. We provide highly-accessible, affordable materials on various aspects of the industry to both existing contractors and those who wish to break into the field. Construction Project Management: A Complete Introduction focuses on the fundamental issues in the development and management of construction projects. This straightforward and readable yet thorough textbook focuses on the role of the contractor, taking the reader from start to finish in construction projects — from the early developmental stage through bidding, selection of the contractor, the construction itself, and close-out. Construction Project Management: A Complete Introduction has been adopted by technical schools, colleges, and universities throughout the United States. Also available now: Green Construction: An Introduction to a Changing Industry, a hardcover textbook for builders transitioning into sustainable construction. See here for further details. Available at Amazon. "Construction Project Management is informative and easy to read. It clearly outlines the professional building processes and procedures. 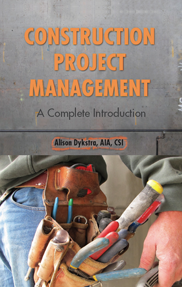 It is a great book not only for students, but for the building professional as well." 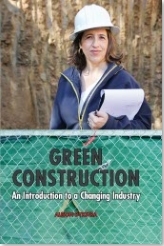 "This book is a great introduction to the field and represents a powerful argument for an increased focus on green construction. Dykstra's writing is clear, concise and well informed by decades of experience in the field."